They’ve had their charity license revoked. In the last two years, only two issues of their 6/year magazine “Living Wisdom” has been released (and despite being so far behind in issues owed, they’re still actively pushing subscriptions). They regularly cry oppression, censorship and demand free speech, despite blocking/banning anyone who dares counter their supposed-not president Meryl Dorey with information that is nothing more than factual. They have also been caught filing numerous false DMCA requests to hide public and factual information they don’t like. The Australian Vaccination Network about as hypocritical as one can get. Who are Stop The AVN? Fortunately there’s also groups out there who try to combat the Australian Vaccination Network‘s misinformation campaign, one of which is called Stop The AVN (StopAVN). Despite being completely banned from the AVN‘s mailing list, FaceBook page, and google group for the reasons mentioned above, they’re doing an amazing job at countering the AVN‘s misinformation campaign. With their own FaceBook page and information website they regularly counter Meryl‘s false claims, and have done some great work putting the AVN in its deserved place. The ABC for example have been told globally not to use her as an expert in vaccines, and that if she is to talk at all it’s to be made clear she’s an anti vaccination promoter. Unlike the AVN which was a charity (license revoked) and is still a registered non-profit business, StopAVN is just a loose collection of people with common interests. They don’t have any official structure, nor do they ever campaign for funds. Anything and everything is done entirely on the individuals time and with their own personal funds, simply because they care and are passionate about the wellbeing of others, helping out those who are too young to be vaccinated or who are immuno-comprimised so vaccines cannot help. Last but not least in this little sordid tale is the Woodford Folk Festival (WoodfordFF). It is a music/culture festival held near Woodford in Queensland every year between Christmas and New Years. For the last few years they’ve invited Meryl to talk and give her false information on the topics of vaccines and autism. Two years ago Meryl spoke as well, and all attempts to have this stage removed from her failed. In fact it became quite clear that the people behind WoodfordFF were very in support of things like alternative (read: Ineffective) medicine, anti-vaccination, and just about anything not supported by evidence or science. This extends to the point where they even have a homeopathic first aid tent on site. Last year Meryl didn’t attend due to schedule conflicts, but this year she was invited back and accepted. StopAVN first approached WoodfordFF to let them know just what/who they were providing a platform to, and they didn’t care. If anything, their response yet again showed they supported the unhealthy and dangerous stance Meryl promotes. StopAVN then went to the media contacts. This second approach has proven more successful, with numerous sponsors pulling out due to the misinformation claims not only of Meryl and the AVN, but also of other stalls and speakers at WoodfordFF. Numerous organisations including council/governments who support but don’t sponsor the festival requested their names and logos be removed from sponsor lists. Through some great activism, StopAVN have managed to get WoodfordFF to reluctantly act, although not as much as I and many others would have liked. WoodfordFF have decided to step back from giving Meryl an unchallenged stage to spout her lies and misinformation, and have allowed an immunologist to go up in debate against her, with a person from the World Health Organisation as the moderator. This is great news, but debates still aren’t the best either. They are won not by who is correct, but who is the most confident. You need to keep your information short and sharp. It is much easier to do that with lies and false statements that sound like “statements of fact” when said confidently. Here’s hoping the moderator keeps her on a tight leash, stopping her on any lies. It’s a good step, but Woodford Folk Festival are still not doing enough for the wellbeing of their patrons. Remember, this isn’t censorship. It isn’t silencing her either. It is just refusing her a stage. She is still free to spout her misinformation, but she’ll have to do it elsewhere. EDIT: OH MY FRACKING GOD! News has just come in that Stop The AVN have managed to pull something off I would not have expected in a hundred years! They had people handing out these awesome pamphlets to counter the misinformation they’re expecting Meryl Dorey to be spouting. Not only that, while Meryl was on stage spouting her misinformation (and for two hours after), StopAVN managed to hire a plane to fly over the festival with a banner in tow stating “Vaccination Saves Lives“! This would have been flying above WoodfordFF right in Meryl‘s face during and just after her talk! BRILLIANT! So much praise to Stop The AVN! My hat and pants go off to them. EDIT 2: Stop The AVN have released some banners we can put on our blogs. I’ve added them to the top and bottom of this post and will shortly be putting it on my blog sidebar as well. I’m still waiting (hoping) for pictures of Meryl‘s talk and the plane, and will edit this a third time when I can get them. 😀 Bravo StopAVN, Bravo. Vaccination Saves Lives – Press Release from StopAVN. Vaccination Saves Lives – Pamphlet being handed out at WoodfordFF. Vaccination Saves Lives – StopAVN. 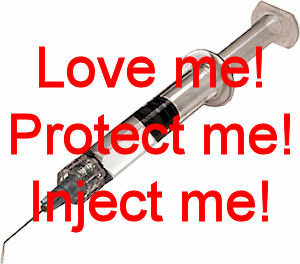 My past blog posts about Vaccines/AVN. HCCC Public Health Warning about the Australian Vaccination Network. Stop the Australian Vaccination Network Facebook Page. Stop the Australian Vaccination Network Website. Scopie’s Law (details about whale.to).